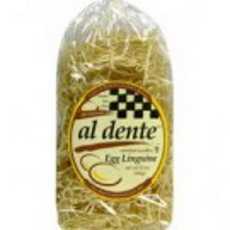 Enjoy Al Dente Egg Linguine . Case Of Six 12-Ounce Bags (Total Of 72 Ounces) All-Natural, Hand-Crafted, Homemade-Texture Egg Linguine Made Of Enriched Semolina And Durum-Wheat Flours And Whole Eggs Cooks In Three Minutes; Certified Kosher Mixed, Rolled Out, Cut, And Dried In Small Batches By Family Company In Whitmore Lake, Mi (Note: Description is informational only. Please refer to ingredients label on product prior to use and address any health questions to your Health Professional prior to use.